Kimochi is Japanese for “feeling,” and that’s exactly what kids do every minute of every day, whether they know the words for those feelings or not. So why not combine a favorite toy (a huggable, lovable plush) with a safe, fun way to not only explore feelings but also recognize and name them? That’s what the team at Kimochis set out to do. Creator Nina Rappaport-Rowan, 1st on the right, used her background in animation (she won an Oscar for her animated short film Bunny in 1998) to invent characters that kids can identify with. Each Kimochi has a different personality. Kimochi Cloud can be moody, while Bug is a caterpillar afraid of change. Cat is persuasive and sometimes bossy, and Huggtopus is all smiles. 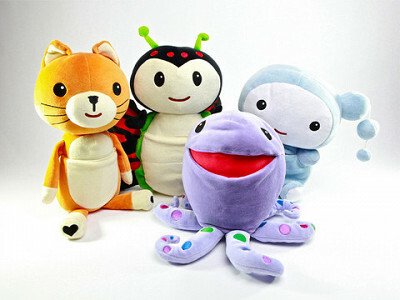 Each character comes with three small feelings pillows and a “How To Feel” guide for parents to share with their kids. Additional sets of feelings pillows are available, each including a make-your-own-feeling pillow, so no emotion is left uncovered. A child can choose a pillow to tuck into a character’s front pouch, and you can spark a conversation that builds understanding and empathy. It’s play, it’s fun, and it’s a simple way to strengthen bonds and build emotional and social intelligence. We love how Kimochi’s communication expert Ellen Dodge says they’re increasing the “kindness footprint.” You can be mad without being mean; you can talk about feelings and change them into something better. Brilliant. Kimochi’s will probably resonate most with kids age 3-10, but greater empathy is suitable for all ages. My name is Nina Rappaport Rowan and I am honored to be able to present our new line of plush toys to you. They are called Kimochis - Toys with Feelings Inside. Kimochi means Feeling in Japanese, and they are toys that were developed to teach parents and children how to identify and communicate feelings in a fun and comfortable way. Now between you and me, I have spent enough time on the "couch" to know how important it is to be able to communicate how you are feeling. If I had been taught at a younger age how important social and emotional learning was I would have invented this a long time ago!!!! But the good news is, they are available today, and we are fortunate enough that The Daily Grommet is letting us spread the word. There is a great disconnect between parents and children today and our goal is to close the gap. We want to strengthen parent child connections and teach our children how to express anger, sadness, and happiness in the most effective and positive way they can. We want to provide them with basic tools to help them navigate our world - which seems to be getting tougher and tougher each day. So, we are proud to share our Kimochis with you. And we hope you will share them with your children. Hi Daily Grommet fans! My name is Ellen Dodge. I'm eager and excited to have the opportunity to share our beloved Kimochis™ with you. Officially, I'm known as Ellen Pritchard Dodge, M.Ed. CCC-SLP, but you can call me Ellen. Since the early 80's, I've been teaching communication and character education to children ages 2-13. In 1991, I published The CommunicationLab: A communication based classroom program (known in the field as "the purple book"). When I met Nina, the founder of Kimochis™, I was instantly thrilled because I saw a fun vehicle for children to learn positive ways to connect. Parenting is a very emotionally charged journey! When your child melts down, few parents think "...oh good, my child is learning how to understand and express frustration." Instead, we often feel mad, frustrated, worried or shamed. Feelings can be messy...and that's why I'm drawn to Kimochis™! 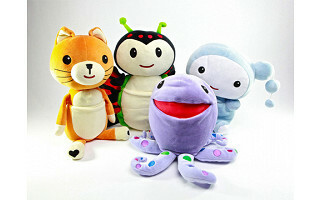 Kimochis™ are the toy and tool to help you and your child learn to understand and manage upset feelings. I love working with parents, teachers, and children on the basics of communicating feelings. And, I'm so excited to have the opportunity to connect with you, Daily Grommet fans, today. Feel free to ask specific parenting, teaching or communication questions if you have them! It has been my good fortune to have incredible conversations with both Ellen and Nina recently. I encourage you to ask specific questions about how to use Kimochis -- or really about anything related to communication and your own children. Ellen is the official Kimochis communication expert, who truly believes that we build character and confidence in our children when we give them the tools to name and talk about feelings. We have access to someone here who I believe is an amazing resource for parents everywhere. I am truly touched by the good intent of the Kimochis enterprise -- and frankly,the women on the Kimochis team sound like a ton of fun, too! So jump in the conversation - we've got a great day ahead of us. Feeling excited, grateful and happy to be a Daily Grommet and connect with parents and their many feelings about parenting. Truly a 24/7 emotional journey. Kimochis can help! Thanks! I agree and can't take credit for the idea as that was Nina's brain child. I did however got lucky to connect the educational component to this adorable toy. Kimochis are a family dream when it comes to helping kids GET what they are feeling and use words and a positive way when upset. It gives me hope for our planet! These are so sweet while capturing so many of the personalities of my child and his friends! I think I have a 'Bug' on my hands. One of the biggest challenges we've had has been working through separation anxiety. It still rears its head when least expected. Any advice for those of us with Bugs? I don't want him to miss out on some great opportunities because of his anxiety. I so GET what you want for your boy. Feeling scared to separate is one of the biggest emotional places children have to learn to move thru. I am so glad he has you and BUG. Here are some specific ways to help your son using his Kimochis. #1 Kids love stories and learn easily when we frame learning in a story. Example, "Let me tell you a story when I was a little girl and I was afraid to say goodbye to my mommy." Add lots of specific details to capture his attention and imagination. Then, slow down to say, "And then I would tell myself, even though I felt sad and scared to say good bye to my mommy, I would say good bye and know that my mommy would come back to get me. And she always did just like I always will." Now your son has your story and words you and he can repeat when he feels sad and scared to say goodbye. You can say, remember what helped mommy when I was a little girl. I would say, My mommy always comes back to get me just like your mommy always comes back to get you." #2 When your son does NOT have to say goodbye, have him tell you a story about places he gets to go and you don't get to be there such as school, grammas, out with daddy. Help him choose the Kimochis to tuck inside Bug that he remembers feeling when he is without you. (I feel sad and scared). Now mommy adds the Kimochi feeling Brave to tuck inside Bug and tell your son, "And (Billy) is brave because even when he feels sad and scared to not be with mommy he can get himself to say goodbye because he knows I always come back." #3 On the day your son must go somewhere without you, help him tuck his Bug with Feeilngs. Does he want you to keep sad and scared so you know what he is feeling or does he want to tuck those inside Bug to bring with him? Together tuck the feeling brave and remind that brave means we do feel scared but we can get ourself to bravely say goodbye because we know mommy always comes back. Hope that helps. And, remember, one day you will miss that he wants you to be there 24/7 as he sleeks into the room as a teenage boy and wonders why you are in his personal space. Oh my how they change! I love these toys! Today, I'm in need of some parenting advice. My 8 year old daughter's best friend lives right next door. They are involved in DIFFERENT soccer leagues. Our neighbor was waiting at the fence this morning to show my daughter the trophies her team won yesterday (they got 1st in their league!). Neighbor girl was genuinely proud and wanting to share her accomplishment with my daughter. Instead of being happy for her friend, my daughter was clearly jealous (because her soccer team didn't do so well this season). She ignored her friend and got right into the car to go to school. My husband talked to her about it, but I'd like to follow up this afternoon after school. We've already put emphasis on "soccer is for fun, it's good to learn to win AND lose, we don't keep score, you're team is working together and winning isn't everything", but my little girl has a little competitive streak. She's blaming the neighbor girl for "acting like a teenager", but I know my daughter is just jealous. How should I encourage her to be happy for her friend so that her friend doesn't end up feeling hurt? It is hard to feel happy for others when we are not happy with how things turned out for us. This is my favorite definition of jealousy and one to share over and over with our little ones. It teaches our children that both feelings are true and can exist at the same time. Happy for you and sad for me. And, it is easy to be happy for ourselves and we can tell our kids it takes practice feeling happy for others when we feel jealous of how things turned out for us. You and your Kimochis can help your 8 year old now learn what she can do with these feelings that won't be hurtful to her neighborhood pal. After your little one returns home from school and has eaten and had time to simply hang out with you, imitate a conversation that begins something like this. Now, play a game with your Kimochi. Take turns holding your Kimochi and sharing how you wished things would have gone. "I really wished our team would have won." (Acknowledge her feelings) Next name how lucky the other girl is. "Claire was so lucky to be on the winning team." (Acknowledge this feeling) End this game by thinking of kind words you can say to someone when you want to practice being happy for them but you are feeling sad for yourself. "I'm happy for you your team won." Remind your daughter it takes lots of practice to learn to be happy for others when we feel jealous but that you know she will be able to one day more easily be able to recognize she feels jealous and work thru the feeling so that she does not accidentally say or do anything hurtful. Keep open communication by letting her know how much you enjoy being able to work thru feelings together and that you hope that the next time she notices she feels jealous she can tell you what she decided to do with this challenging feeling. Ellen, I like what you wrote about jealousy. This seems to be a really big issue with girls. How would you suggest a child work through the situation the next time something like that occurs? It's so tough for children to know how to hold back feelings like that in a social context (which is what schools and society expect them to do). Telling our children that this WILL happen again is really helpful....For example, after working thru jealous feelings you might say, "Sadly, you will FEEL jealous again as this is a feeling that comes and goes Next, predict what upcoming situations both of you could experience jealous feelings? (You take a turn: "I can imagine I might feel jealous if...." Now, your daughter takes turn.) Next, both share how you hope to handle these feelings in a way that would make you feel proud. "We can feel proud if we can be kind and polite instead of hurtful when we feel jealous"
For example, tell your daughter then next time you feel jealous you are going to say to your friend, "I'm happy for you but I am still having a hard time as I feel disappointed that (describe reason for disappointment). It is helpful to remind that many times we need to say friendly, kind words such as, "I am happy for you" before we can feel truly happy for the person. This is a distinction to explain to our children so they do not think we are expecting them to really feel happy for others when they are struggling with sad and jealous feelings. We are however expecting our child to practice communicating in polite, kind ways amidst challenging feelings such as jealousy. Hope that helps! I am so thrilled to see Kimochi here on Grommet. My daughter and I were just holiday shopping at Early Works in Petaluma this morning and I heard that this was a local product from Marin County. The owner highlighted the product to me. I'm glad to have more color/info on it here and this will definitely be on our Christmas list next year. Wow - I'm learning a lot from Ellen today. If anyone else has a thought or question, either about Kimochis or about kids and emotions, bring 'em on. What a great idea. I'm "feeling" happy just looking at them. I just purchased the Huggtopus and the Cat. They were recommended to me by a Child Specialist who works with a special needs student in my second grade classroom. (She mentioned that autistic students are drawn to the cat.) Can you give me some ideas as to how to use these in the general education classroom setting when we track on (year round) again in January? @Mrs. Teacher - Thanks for stopping by! We're forwarding your question on to Ellen. The feel good packages - #1, #2, #3 which emotions are in each? * Mixed Feelings Pack 1 gives you more feelings to share with family and friends. Includes: Jealous, Loved, Grateful, Scared, Shy, and one Make-Your-Own feeling with washable pen all in a clear pouch. * Mixed Feelings Pack 2 includes Kind, Hurt, Sorry, Uncomfortable, Friendly, and one Make-Your-Own feeling with washable pen all in a clear pouch. * Mixed Feelings Pack 3 includes: Sleepy, Surprised, Embarrassed, Guilty, Excited, and one Make-Your-Own feeling with washable pen all in a clear pouch. My 9-year old son received a Kimochi as a gift, and he just adores it. I love the way he uses the pillows to show me his feelings. Last night, he adorably showed me "grateful" before bed and said he felt grateful to have such a great family and friends. He made his own feeling, "playful", too. Love this. @bg - It doesn't get much better than that, wow! Thanks for stopping by. Do you give lectures or consult? How can I contact you? @Ruth - we have sent Ellen your contact information. Hi, I do preschool aftercare at a small school from nap time through parent pick-up time at 6:00. Emotions can be all over the place during these hours. "Will Mommy come?" "I'm tired of being with all these friends, I just want some alone time." I think Kimochi's might really help me to communicate that ALL those feelings are ok. Some of my aftercare friends are super-clingy, some get pretty grumpy with their friends. Can you give me some advice on the best ways to use Kimochis with my group? @Mary: These would be great to have on hand, especially with such a wonderful grown-up like you who clearly is ready to embrace their moods and help them understand them. I have sent Ellen your note. After watching the video, I still don't understand what the Kimochi does - do they make noise because a child cannot read to put the correct cushion inside. Kimochi is Japanese for “feeling,” and that’s exactly what kids do every minute of every day, whether they know the words for those feelings or not. So why not combine a favorite toy (a huggable, lovable plush) with a safe, fun way to not only explore feelings but also recognize and name them? That’s what the team at Kimochis set out to do. Creator Nina Rappaport-Rowan, 1st on the right, used her background in animation (she won an Oscar for her animated short film Bunny in 1998) to invent characters that kids can identify with. Each Kimochi has a different personality. Kimochi Cloud can be moody, while Bug is a caterpillar afraid of change. Cat is persuasive and sometimes bossy, and Huggtopus is all smiles. Each character comes with three small feelings pillows and a “How To Feel” guide for parents to share with their kids. Additional sets of feelings pillows are available, each including a make-your-own-feeling pillow, so no emotion is left uncovered. A child can choose a pillow to tuck into a character’s front pouch, and you can spark a conversation that builds understanding and empathy.